WASHINGTON (CNN) -- Nearly nine in 10 Americans say they think Iran is trying to develop nuclear weapons, according to a new national poll. 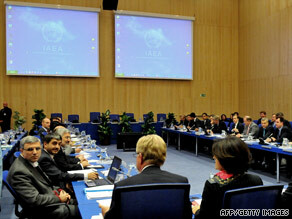 Western powers and Iran meet this week in Vienna, Austria, to discuss Tehran's nuclear future. Eighty-eight percent of those questioned in a CNN/Opinion Research Corp. survey released Tuesday say the Iranian government is attempting to develop nuclear weapons. But it appears that's where agreement ends as the survey indicates there's little consensus on the best approach to addressing the situation -- though the poll does suggest a military response is not as popular as nonmilitary options. The survey's release comes as talks in Vienna, Austria, are resuming among Tehran and representatives of the United States, Russia, France and the International Atomic Energy Agency over the future of Iran's nuclear program. According to the survey, military action is less popular, but 54 percent do favor a strike against Iran to keep it from becoming a nuclear power. "More than six in 10 men favor military action against Iran. Women normally tend to oppose military action in most situations, but they are split down the middle on Iran," said Keating Holland, CNN's polling director. "Democrats are following the same pattern. It's possible that the threat of nuclear weapons makes a military option more palatable to some Americans who would normally oppose it." The CNN/Opinion Research poll was conducted Friday through Sunday, with 1,038 adult Americans questioned by telephone. The survey's sampling error is plus or minus 3 percentage points.